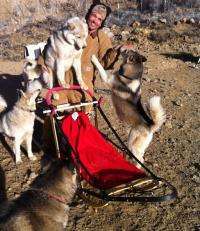 California dog driver Tony Phillips poses with his new sled near Mammoth Mountain. In winter 2011 this spot was covered by several feet of snow; in 2012 it is bare dirt. Winter seems to be on hold this year in some parts of the United States. Snowfall has been scarce so far in places that were overwhelmed with the white stuff by the same time last year. Here's a prime example. "The Mammoth Mountain ski resort in the Sierras of California got more than 200 inches of snow last December," says NASA climatologist Bill Patzert of the Jet Propulsion Laboratory. "This December they got less than 10 inches." Temperatures have flip-flopped too. There were 583 new heat records broken in the first five days of January in the US. "It's 86 degrees in Los Angeles today [Wednesday, January 4th]," says Patzert. "Everyone thinks it's July! In fact, it's warmer today in LA than it was on July 4th last year. And it's been in the 60s and 70 even in the Dakotas lately." On January 5th in Bismark, North Dakota, it was 62 -- a marked departure from their average 23 degrees for that day. It was 66 in Denver, Colorado, where it's usually in the low 40s on that date. What's going on? 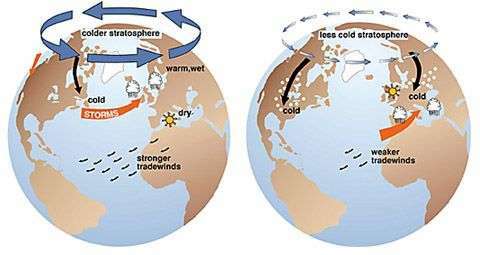 Patzert identifies two culprits: La Niña and the Arctic Oscillation. First of all," he explains, "we are experiencing a La Niña pattern of sea surface temperatures in the Pacific Ocean. This pushes the jet stream and the cold arctic air northward." "On top of that, this year's Arctic Oscillation has been stronger." The Arctic Oscillation is the whirlpool motion of the air around the North Pole. When this motion is weaker, like last year, cold air escapes from that whirlpool and heads southward to the US. "This year the whirlpool has been more forceful, corralling the cold air and keeping it nearer the pole. That has reinforced the La Niña impact." While the corralling action of the Arctic Oscillation has kept snow away from parts of the contiguous United States, it has brought extra snow to places inside the whirlpool. "The strong positive AO has kept the Jet Stream north," says Patzert. "Snow-delivering storm tracks are pounding Alaska." So far in the winter of 2011-2012, the "AO Index" has been mostly positive, signaling a strong Arctic Oscillation. 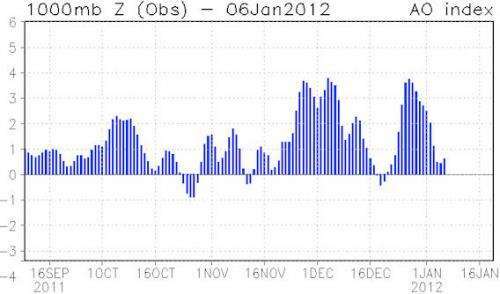 "Compare this to last year's negative AO Index and you can see the difference between the two winters," notes Patzert. Cordova, a small coastal town about 150 miles east of Anchorage, has been especially hard hit. More than 18 feet of snow has fallen so far this winter. Snow dumps are full, roads have turned into one-lane "snow canyons," and National Guardsmen have been sent in to help residents dig out. Even heartbroken snow-lovers of the lower 48 don't want that much white stuff. But they'd like some. "Be patient," advises Patzert. "We haven't gotten to the heart of winter. Hold off on selling the new dogsled. There's plenty of time for snow. It ain't over till the Siberian Huskies sing." TRMM maps a wet spring, 2011 for the Central U.S. Personally, I prefer El Nino because it means lots and lots of rain here in CA. Water is always at a premium especially in Southern CA and La Nina just means more price increases on water. The last thing the people of this state need are more utility costs.